Summer is still here and so many things you can do outside of the house. For me, over here is always summer and I think most of us took that for granted. We rarely plan anything fun to do outside the house. As for me, taking photos is my passion. Now after I owned an iphone and discover iphoneography, taking photos has become easy and so much fun. I don’t really worry about the technicality of it, I just focus on the art and the memories. Ooops I totally forget that I wanted to talk about this amazingly beautiful kit called It’s Summer by Jen C. Designs. It’s 30% off this weekend at Sunshine Studio Scraps. And this is a layout I made using the above kit. 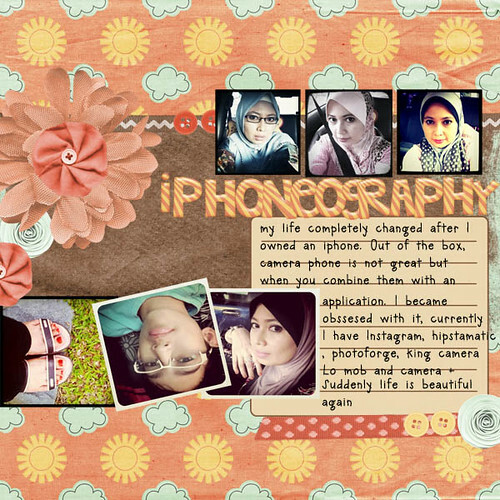 And this layout is my tribute to my passion of iphoneography. Visiting from FTLOB - I havent used my scrapbooking stuff ina while - but this layout is just beautiful. This is a cute idea to use the scrapbooking layouts with your photos! I've never used that! Have you tried hipstomatic or instagram apps on your iphone? They have different filters to make your pictures have different hues and a more artsy feel! Visiting from FTLOB- happy comment love day!